Include jQuery and the plugin on a page. 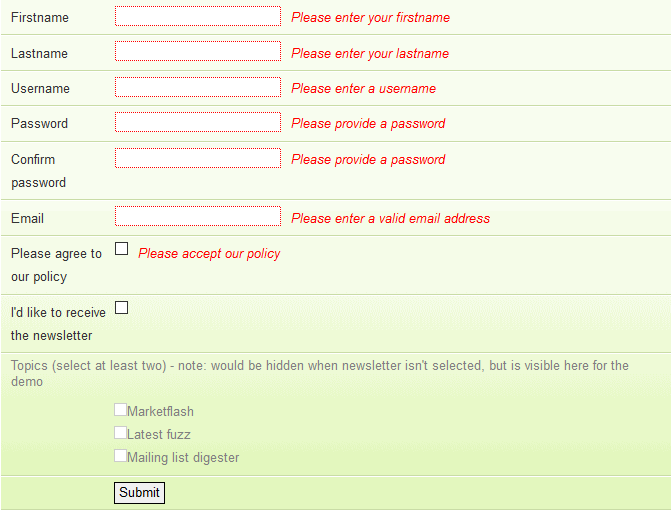 Then select a form to validate and call the validate method. Alternatively include jQuery and the plugin via requirejs in your module. For more information on how to setup a rules and customizations, check the documentation. See the Contributing Guidelines for details. IMPORTANT NOTE ABOUT EMAIL VALIDATION. As of version 1.12.0 this plugin is using the same regular expression that the HTML5 specification suggests for browsers to use. We will follow their lead and use the same check. If you think the specification is wrong, please report the issue to them. If you have different requirements, consider using a custom method. In case you need to adjust the built-in validation regular expression patterns, please follow the documentation.